In Stock (details) Usually leaves our warehouse in 1-2 business days. Let the beautiful and dangerous women of Frank Miller's Sin City protect your precious tables from scuffs, dents, and marks! 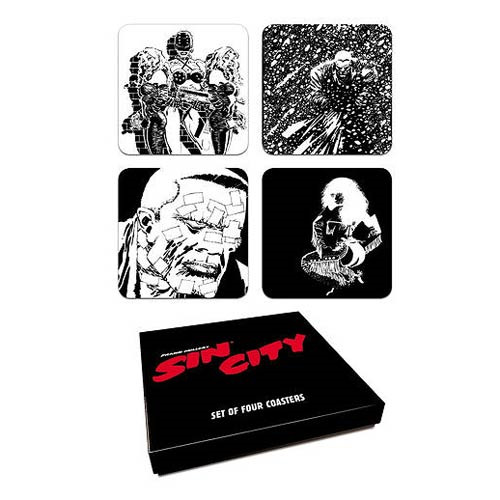 This Sin City Comic Book Series 2 Coaster Set includes 4 cork-backed coasters. Each coaster measures 4-inches long x 4-inches wide and comes packaged together in a handsome box. Ages 14 and up. "I love the products you carry and I found your web site easy to purchase from. Thank you keep up the great work look foworad to more products from your company .. Ronald "
"I love the products you carry and I found your web site easy to purchase from. Thank you keep up the great work look foworad to more products from your company .. Ronald..."